This was a very involved online extension of a well respected and time honored print brand. The look and feel of the New York Daily News in its traditional printed medium is unmistakable to every New Yorker and so the task at hand was formidable. The starting point was the clean up of a trusted and familiar logo in order to extend it online and then the redesign of the digital ‘look and fell’ for the newspaper. 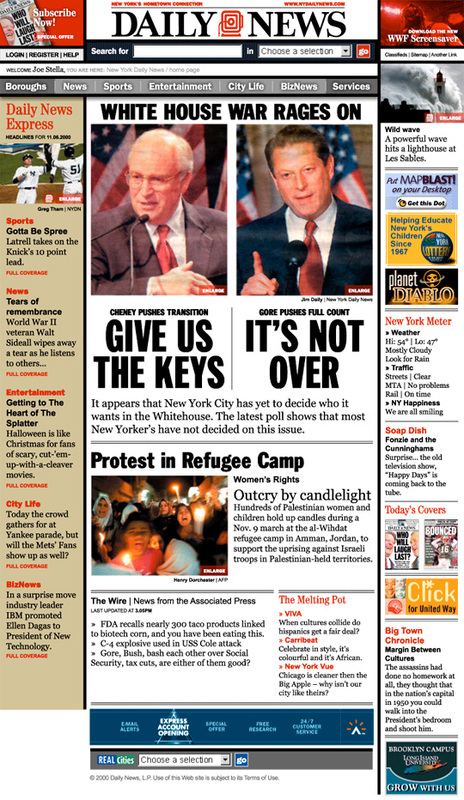 Largest-selling New York metropolitan daily, covering stories that affect New Yorkers. To become properly acquainted with the newspaper I lived with it for approximately two weeks. I noticed that it was portable and easily readable on the subway but then when I did get to work I had to wash my hands of the black ink. It was fairly right-wing, had a huge library of photos at it’s disposal (larger than that of the New York Times) and if you were a sports fanatic this was the newspaper you read. My conclusion after those two weeks was that its brand was already a definite force, stable and well respected. 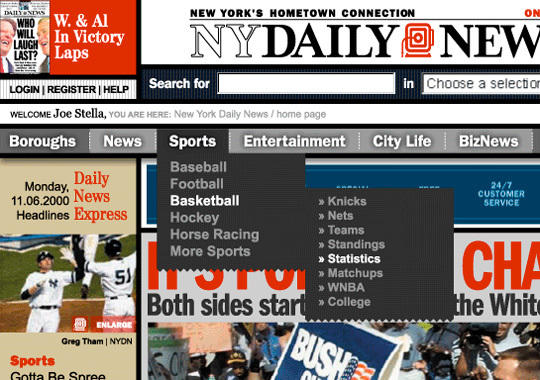 I went into the pitch concentrating on the fact it was an everyman’s newspaper, familiar to every New Yorker and part of their daily routine for that subway ride into work and therefore its online extension should be just that. What followed was a bold, assertive design reminiscent of its rational brother. 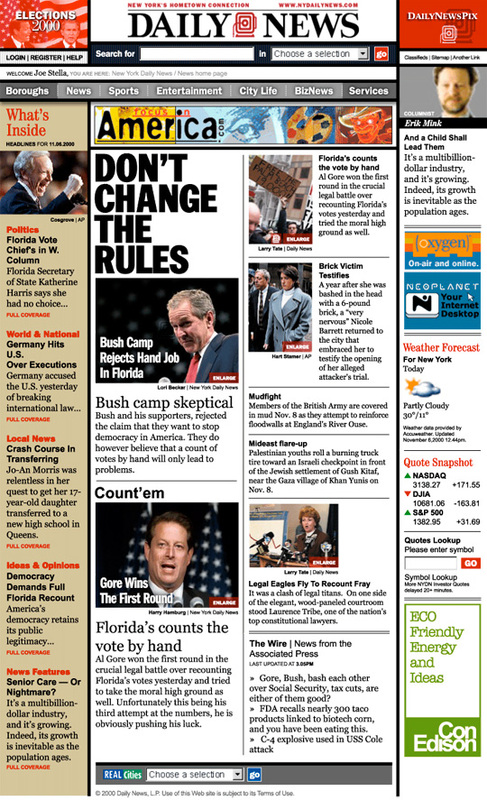 It is interesting to note that newly redesigned online version has completely lost its faithfulness to the traditional newspaper and is now unfortunately nondescript. To extend the print brand online. 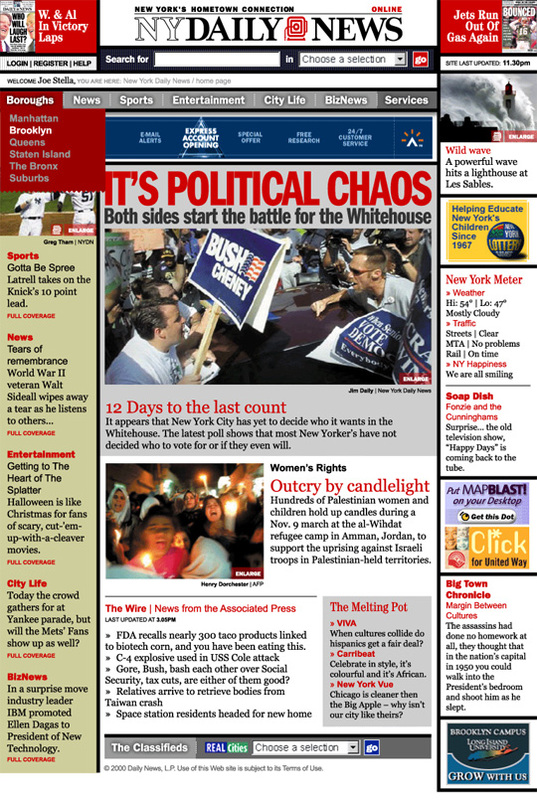 It was decided that the online brand should be more faithful to the newspaper. 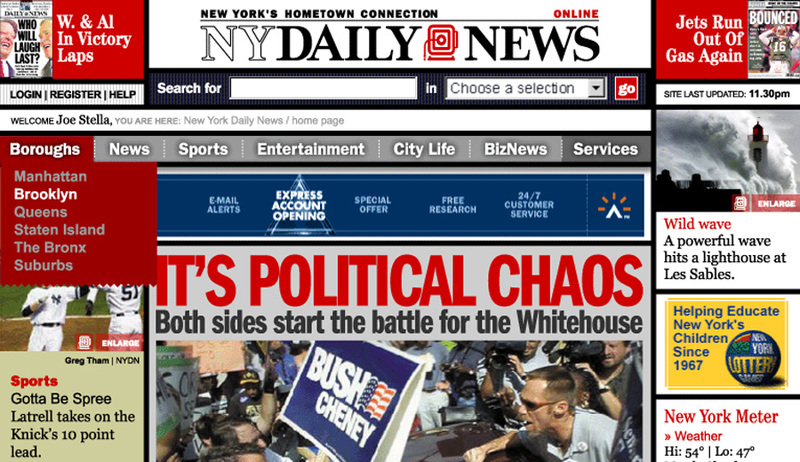 The previous attempt to port the brand online was too “tricky” and nondescript so much of the NYDN style became lost on the low resolution of a monitor. As a result, the logo was redesigned so that the online identity and section identities would be harmonious with the newspaper’s, the editorial voice and image content was augmented and the advertising placement was substantially improved. In behind the scenes, the client-side interface for the delivery and deployment of content was vastly improved a complete restructuring of the content production process to ease workflow concerns was implemented. This entry was posted on 2009.01.01 at 6.30 pm and is filed under Publishing. You can follow any responses to this entry through the RSS 2.0 feed. You can leave a response, or trackback from your own site. Human Verification: Sum of 2 + 3 ?